This post is not written by me and copied from a blog Saleha's Makeup Diary. This is shopping season & another perk of madness for shopaholics is BLACK FRIDAY. 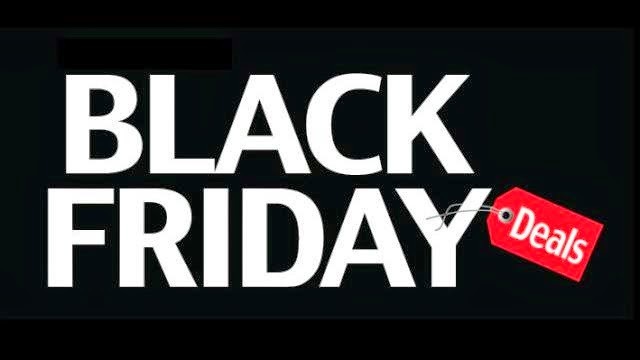 Black Fridayis the Friday following Thanksgiving Day in the United states. (the fourth Thursday of November), often regarded as the beginning of the Christmas shopping season. Actually i love the word "Shopping" it just makes me go turbulent. Let me introduce some of the deals offered online for MAKEUP GEEKS. Missguided: Take 30% off your entire purchase of festive clothing and accessories on Black Friday and Cyber Monday, with the code CYBER30 at missguidedus.com. Joy & Mario: From Thanksgiving to Cyber Monday, buy one pair of shoes, get another free at joyandmario.com. Cocoa Jewelry: On Black Friday, take 40% off sitewide, and on Cyber Monday, take 50% off sitewide at cocoajewelry.com. The2Bandits: From 11/30-12/3, use code CYBERBANDIT40 to get 40% off boho-inspired jewelry and accessories sitewide at the2bandits.com. Reef: On Black Friday, score 25% off surfer-chic apparel and accessories sitewide at reef.com. On Cyber Monday, get 20% off sitewide. Laura Geller: From 11/26-11/30, take 25% off beauty products with the checkout code FRIDAY25. Take 30% off orders over $100 with the checkout code FRIDAY30. On Cyber Monday, get a free 3 Piece Laura Geller Beauty Essentials gift that includes a travel size blush-n-brighten and mini blush brush for orders over $40. Use the checkout code CYBERGWP and shop at laurageller.com. Urban Decay: On Black Friday, get the Ammo Palette, Smoked Palette, and a deluxe sample of Perversion Mascara for only $30. On Cyber Monday, get the Electric Palette for only $35, and you'll also get a bonus delux sample of the 24/7 Velvet Glide-On Eye Pencil in Black Velvet. Enjoy free shipping on both days on urbandecay.com. Priti NYC: Take 40% off all nail and skincare products on Black Friday atpritinyc.com. The Body Shop: From 12/1 to 12/2, save 50% on everything at thebodyshop-usa.com, plus get free shipping with any $30 purchase. Shop Prima donna: On Black Friday, take 25% off girly jewelry, apparel, and accessories sitewide and get a free gift with purchase, using the code BF25. On Cyber Monday, take 30% off sitewide and get a free gift with purchase, using the code CYBER30. Also, if you spend over $50, you'll receive a $10 coupon for a future order. Shop at shopprimadonna.com. Tractr Jeans: From Black Friday to midnight on Cyber Monday, 12/1, take 40% off sitewide at tractrjeans.com. US Polo: On Black Friday, take 60 to 70% off sitewide with free ground shipping using the code THANKS. On Cyber Monday, take 60 to 70% off sitewide with an extra 10% off using the code CYBER. Shop at uspoloassn.com. Zoya: From Thanksgiving to Cyber Monday, Zoya is offering 12 nail polish trio sets for $20 with free ground shipping. Shop at zoya.com. Cult of Individuality: Take 30% off purchases of jeans starting Thanksgiving Day atcultofindividuality.com. Use the checkout code CULTBLACK14 from 11/27-12/2. Frends: From Black Friday to Cyber Monday, you can purchase a limited edition bundle of the Layla headphones and the Ella B earbuds for $100 (usually $150 each) on wearefrends.com. Toms: From Thanksgiving day to Cyber Monday, take 25% off select styles ontoms.com. H&M: Take up to 70% off selected items online for some Pre-Black Friday Deals from 11/20-11/29. From 11/30-12/1, take 30% off your entire purchase and get free shipping on all orders over $50 at hm.com. Aritzia: On Cyber Monday, enjoy up to 60% off clothing and accessories from select styles, as well as free shipping at aritzia.com. Sorrelli: From 11/28-12/3, buy one, get one 40% off sparkly, statement jewelry at sorrelli.com. Score free shipping on Cyber Monday. Noir Jewelry: From 11pm EST of Thanksgiving until midnight of Cyber Monday, use the code BLACK to get 25% off of the edgy jewelry at noirnyc.com. Knockaround: On Black Friday, get a free pair of Black Tortoise Shell Premiums with every order and a free pair of Black Tortoise Shell Fort Knocks with every order over $50 at knockaround.com. On Cyber Monday, get free shipping on all U.S. orders. La Mer Collections: From Black Friday to 11/30, get 30% off plus a Brazilian Druzy necklace gift with purchase for any order over $200 at lamercollections.com. From Cyber Monday to 12/3, take 35% off with free ground shipping. Stella & Dot: From 11/25-11/30, all sale items will be reduced by an additional 25% off at stelladot.com. On Cyber Monday, spend $50 and get the Avalon Bracelet Clutch in Midnight Black for $9.95. Ruche: From 11/27-11/28, take 30% off cute vintage-inspired clothing sitewide atshopruche.com using the code BLKFRDY. From 12/1-12/2, take 30% off full-priced items— plus, an extra 50% off will automatically be applied at check out. Threadsence: From 11/27-11/28, take 30% off bohemian clothing, dresses, and accessories sitewide at threadsence.com with the code BLACK30. From 12/1-12/2, take 30% off sitewide with the code BETTER, or spend $500 and get 40% off sitewide with the code BEST. Dormify: From Thanksgiving through Cyber Monday, dormify.com is offering 30% off site-wide with the code SECRETSANTA, plus additional markdowns up to 70% off on all of the cutest dorm bedding and accessories. Modcloth: From 11/26 to 11/30, tons of super-cute new clothes will be 50% off atmodcloth.com. From 3pm EST on 11/30 to 1pm EST on 12/3, the entire site including clothing, shoes, accessories and gifts will be offered at 25% off with the code CYBERMONDAY. PacSun: From midnight of Thanksgiving to the end of Black Friday, everything sidewide at pacsun.com will be buy one, get one 50% off. On 11/30, everything sitewide will be 30% off. On Cyber Monday, discounts will be up to 50% off sitewide. On 12/2, everything sitewide will be 30% off. *This post is not written by me, you can check other deals on the above mentioned links. Ahh you are so lucky, these are some insane deals! I so wish I was over in the US for Black Friday I would tear Sephora up like nobody's business haha! So many amazing deals, I hope we have some good ones here in the UK! Great post. You've provides lots of details. thanks shumaila...this post was a great help...i have placed my black friday haul's order! I've just compiled a list of UK deals and I can't believe how many there is! Thanks for sharing! I'm really careful with my money but these are tempting! I love black friday deals!!! This year I had to control a bit of my spending but I did good and didn't purchse too much.